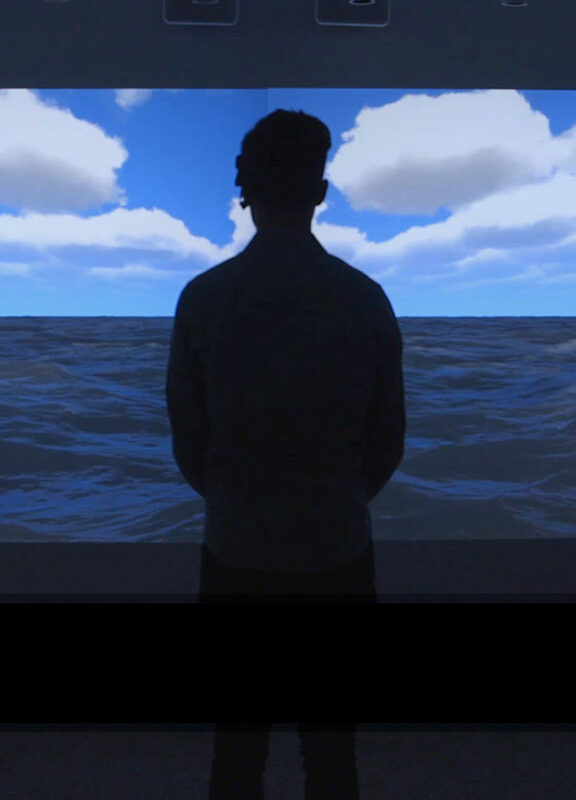 This interactive installation allows participants to control a digitally simulated ocean using only their brainwaves. Calm seas and storms alike are powered by the viewer’s thoughts; the sheer act of concentration can conjure a squall or sunshine. Participants intentionally control their thinking while surrounded by the magnified consequence of their thoughts. A participant wears an EEG (electroencephalography) headset that measures her approximate attention and meditation levels via brainwaves. Attention level affects storminess: with higher concentration, the waves get higher and the clouds thicken. By calming her mind, the subject can create a calm ocean. Humanity’s relationship with the natural world is complex. Humans have a nervous system and perceive an illusionary boundary between their bodies and rest of the world. A sip of water we drink was once in the ocean, a cloud, a plant. An atom in our body is billions of years old, coming from dying stars, and each atom has been a part of so many things: stardust, soil, sea, clouds, air, single-cell life, fish, bugs, birds. This concept appears in different versions of indigenous cosmologies, Sufi mysticism, Big Bang theory and the history of evolution. “You are the Ocean” is a reminder that our presence and thinking have a direct impact on the planet. As Donna Haraway articulates, humans are not superior to any ecosystem and they exist in the intertwined web of all ecosystems as an extension of the planet. Özge Samanci, a media artist and graphic novelist, is an associate professor in Northwestern University’s School of Communication. She completed her PhD in digital media at the Georgia Institute of Technology. From 2009 to 2011, she was an Andrew Mellon Postdoctoral Fellow at the University of California, Berkeley. During Fall 2017 she was Holtzbrinck Visual Arts Fellow at the American Academy in Berlin. Samanci’s recent installation “You are the Ocean” will be exhibited at Currents New Media, FILE Festival, and SIGGRAPH Art Gallery. Her interactive installations have been exhibited internationally, including at FILE Festival, The Tech Museum of Innovation in San Jose, WRO Media Art Biennial, Athens International Festival of Digital Arts and New Media, ISEA (International Symposium on Electronic Art) among others. Her autobiographical graphic novel “Dare to Disappoint” (Farrar, Straus and Giroux, 2015) was reviewed in the New York Times, Guardian, Slate, New Republic, Publishers Weekly, Kirkus, Daily Beast, and the Smithsonian, among others, and has been translated into Korean, Dutch, Turkish, Italian, Romanian. Gabriel Caniglia studies Cognitive Science and Computer Science at Northwestern University. His interests lie broadly in human-computer interaction and immersive technologies. He spends his time outside of class working at The Garage, Northwestern’s center for entrepreneurship and innovation, where he manages the Makerspace and VR/AR Lab. He is also part of an Industrial Engineering team that provides a data visualization system to marathons and other endurance events. He is the programming and implementation lead for the art installation, “You are the Ocean”.